There is so much to think about when you are looking for the best toddler trampoline! We bought our first one when my youngest was just one and there are other things to consider than when buying a kids trampoline. The best toddler trampoline for your little ones is going to be on that meets your needs, and budget. It is likely a long term investment and you want to get the best mini trampoline for your hard earned dollars. With visions of children bouncing and screaming in delight, thoughts of the exercise benefits of getting your little ones moving on a small trampoline and another play area, there are still some reasons to evaluate your specific needs before jumping into a purchase. Before we jump right into the best toddler trampolines I want to ask a few questions. Are you looking for a 10ft trampoline or a baby trampoline or maybe something just to use indoors? How much is your budget? How old are your kids? Think about all of these considerations before you pick out the best toddler trampoline for your family! 1.3 Why are Trampolines Great for Kids? Why are Trampolines Great for Kids? Trampolines are an excellent way to get out the energy inside toddlers! Whether it is a mini trampoline in your backyard or a handlebar trampoline in your playroom, there are so many reasons to love having a trampoline. Children with special needs such as ADHD can often find that a trampoline satisfies their needs to get out their abundance of energy. The best mini trampolines are also beneficial for coordination and balance. After some practice, they can increase confidence in your children. I remember when mine first went to gymnastics and were learning to do a bum drop. Once they nailed it they were so proud of themselves. Trampolines are a great way to teach children how their bodies work and they can work on basic skills. One of the major things that you need to consider when purchasing the best mini trampoline for kids is how you intend to use it. If you want something for your playroom, an indoor trampoline is going to be just fine. But if you want to be able to set it up in the back yard, then you are going to want something that is outdoor rated. Usually outdoor rated trampolines with have UV protected fabrics so they can withstand the UV rays from the sun and will not quickly damage from the harmful rays. If you have somewhere to store your trampoline and only plan to use it on nice days, I do not see why you cannot use an indoor trampoline outside, just be aware of weather conditions, like sun or rain which can quickly damage it. All of the best toddler trampolines that I have reviewed in this guide either have a handlebar or an enclosure (or both) for your little ones. This is probably the hardest choice for me, which one to go for. If you want something small, without barriers, then handlebar style is perfect. But if you want something you can fill with balls, something that is outdoor rates or something bigger for them to jump around in, then you should look into a toddler trampoline with an enclosure. When you are looking for the best mini trampoline for kids, keep an eye on the safety features on each one. Things like padding over the springs, or models that do not actually have springs, but bands instead all offer different things. When it comes to an enclosure, one that is stitched to the trampoline mat or pad cover is best, so children cannot slip through. It also means that they do not climb under the net, which can cause damage over time. When reading reviews about toddler trampolines with handle bars, many say that their children started chewing on the foam. Putting duct tape over the foam will prevent this. 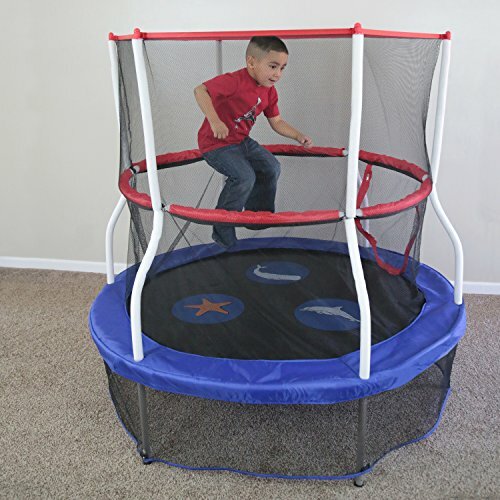 This Little Tykes toddler trampoline is sold only on Amazon and is designed for 3-6 year olds. With that being said, plenty of rambunctious two year olds would have great fun on this toddler trampoline and many 5 year olds would be too big for it. One of the feature that I like is the handle bar so they can jump with ease, especially when they are young. 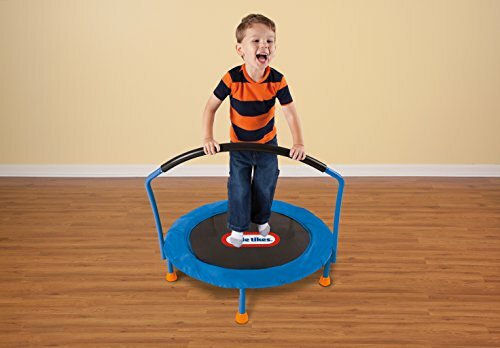 The Little Tykes mini trampoline with handle bar is designed for indoor use only and is ideal for those looking to add a way for little ones to burn off energy inside a playroom or basement. It is easy to install and durable. Skywalker trampolines is a popular brand and they make trampolines of all sizes from the best toddler trampolines to 15’ Trampolines. This 40″ Mini Bounceris a popular choice because of its enclosure net. It also has a 360 degree padded handle bar to help stabilize toddlers as they jump. This also means that the net does not get leaned on and used to push against. 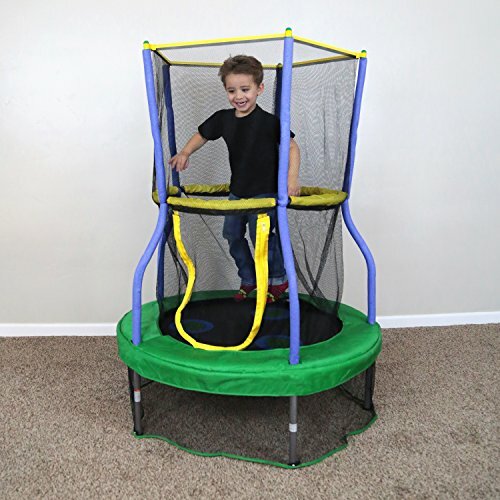 This toddler trampoline is designed for indoor use only and has a 100 lb weight capacity. It is designed for 3 to 7 year olds but again, a 2 year old could easily use this trampoline and a 7 year old would probably want a larger, outdoor trampoline. Skywalker has added design elements to their trampoline with its lily pad design on the mat. 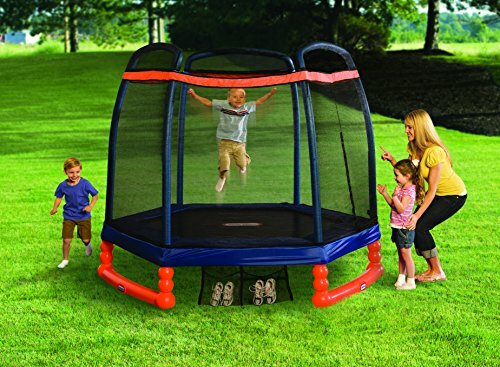 This trampoline from Skywalker is similar to the 40″ model above, but has a larger surface area. It also has the 360 degree bar for stability and an enclosure net. the Enclosure net is sewn right into the padding meaning there is no gaps between the net and the padded cover. Under the pads there are not even traditional springs. Instead there are stretch bands which offer a great bounce and peace of mind for parents. This toddler trampoline is ocean themed and like the 40″ model above, has a 100 lb weight capacity. Skywalkers attention to safety means the enclosure bars are padded and the padded mat is made of durable materials. 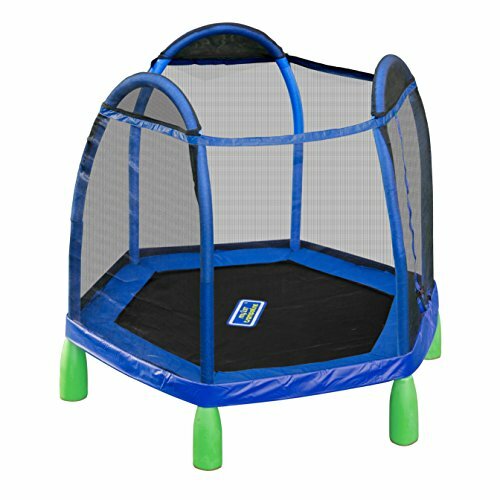 This mini trampoline is also indoor rated and designed for 3-7 year olds. I would again advise that 2 year olds could use this and I think it has better value than the 40″ model as long as you have the space for it. 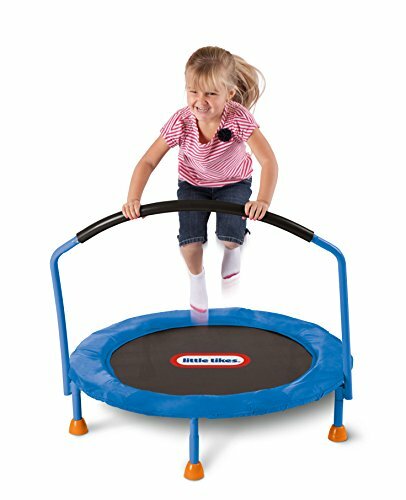 This Sportspower Mini Trampoline is one of the best toddler trampolines because you can use it inside or outside! It is a 7ft trampoline, so one of the larger sizes for mini trampolines. It is recommended for children aged 3 and up, but use your own discretion. This little trampoline actually has springs, where most of the smaller ones have stretch bands. There is a padded cover over the springs. The enclosure design means that there is a gap between the pad and the bottom of the enclosure net, but the trampoline is not far off the ground, so it is more designed as an emergency net to catch wayward bouncers, but it will not prevent toddlers from crawling under the net. The toddler trampoline from Merax is another option with a padded handle bar. 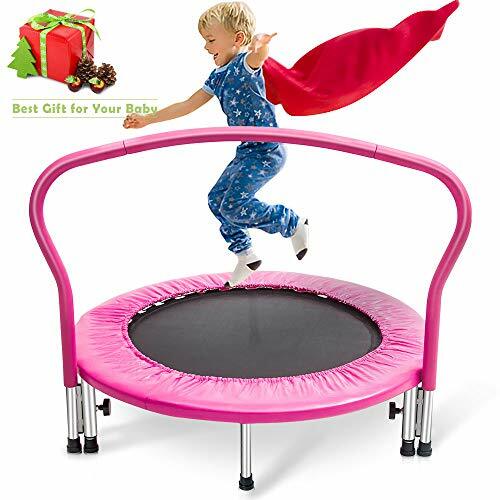 It is a kids indoor trampoline with a 36″ diameter but has a higher weight limit than most toddler trampolines! Merax focuses on building quality products and while they may not offer the cheapest toddler trampoline, they focus on a good and practical build that is safe and going to last. It comes in pink, green and blue and has an oversize handrail that spans the entire length of the trampoline, not just the jumping surface. One of the things that makes this one of the best toddler trampolines with hand rails is that you can easily remove the handrail. I also really like the higher weight limit if I want to use it. This mini trampoline has traditional springs, not bands, which usually makes for a better jumping surface. 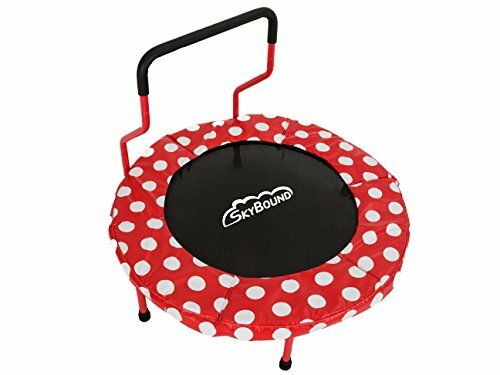 This toddler trampoline from Skybound comes with a handle and is suitable for indoor and outdoor use! Its padded handle curves inward to ensure the jumper is centered in the trampoline. This means that it does get in the way for older children. It is designed for 3-6 year olds but the handle height is probably best for 2-4 year olds. It is rust protected for outdoor use and also has rubber padded feet for indoors. It has vinyl foam padding for over the trampoline’s frame adding to the safety of the design. 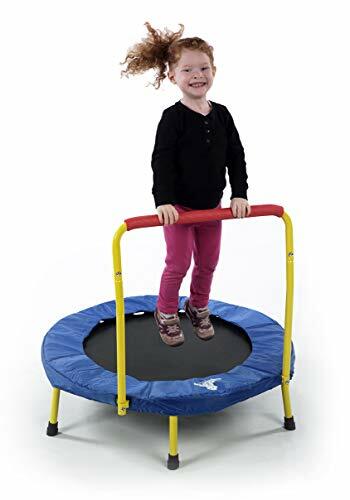 The Fold and Go trampoline from the Original Toy Company is a small kids trampoline that does not need to take up a lot of room. With its folding frame, it can fit into a closet or be put away without being bulky. It has a high weight rating at 150 lbs and is 36″ in diameter. It is designed for children ages 3 and up. One of the great safety features of the Fold and Go trampoline is the slanted feet which ensure the trampoline stays stable on the ground. The Galt Nursery Trampoline comes from a British toymaker, known for quality and safety. 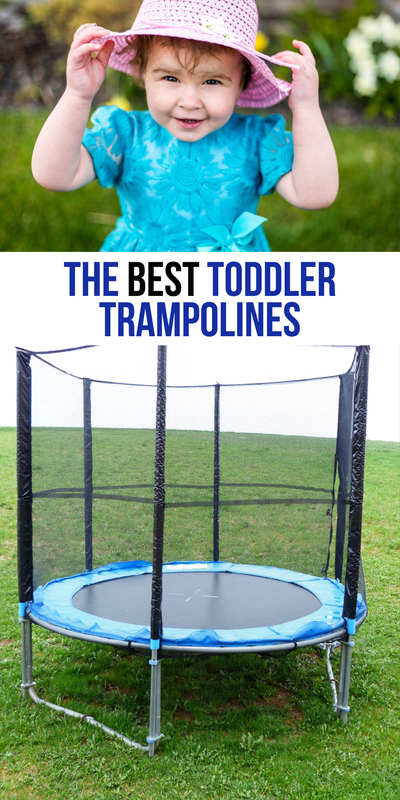 this is the best toddler trampoline that is actually intended for age one and up! It has a low max user rating but it is truly designed for the 1-4 age range. 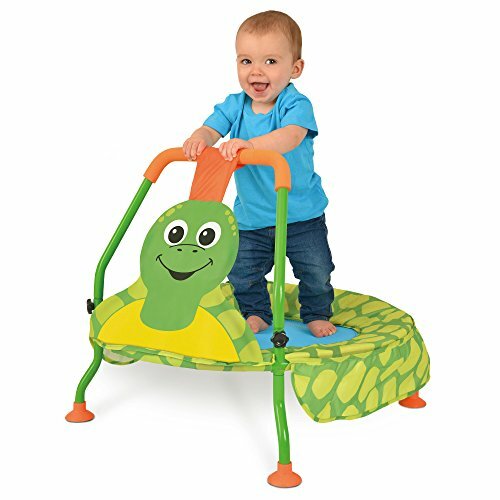 It is much smaller than other toddler trampolines with handlebars and might just be the perfect choice if you are looking for something to get your younger toddler started on. This little trampoline springless design with elastics to ensure there is no pinching as the little ones climb on and off it. Galt also makes another size trampoline for kids, and call it a Junior Trampoline. It is bigger than their nursery trampoline and has a unique square design to it. It has a weatherproof mat, meaning it can withstand outdoor weather and bungee cord style elastics, not springs. 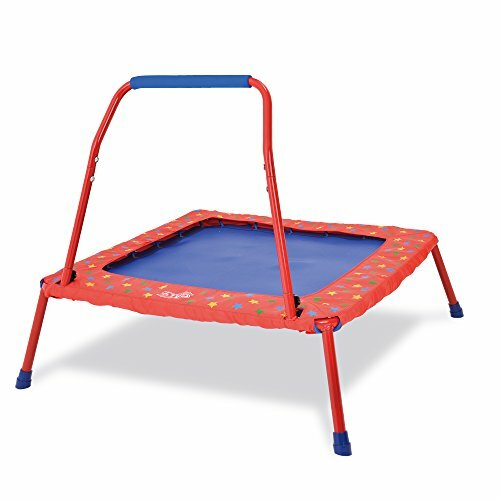 This junior trampoline is intended for users aged 3 and up, and the max user rating is 77 lbs. One of the nice things about this mini trampoline is that the legs fold for storage. You do need to remove the bar, but once done, it can easily be stood up out of the way or put into a closet when not in use. It could even fit under a bed. Click Here to check price and read reviews.